Today marks an “Open huizen dag” in Utrecht, organized twice yearly across the country. It means “Open House Day”- one of the (many) times that a word for word translation serves you reasonably well. Participating sellers open up their homes to everyone on this day, no appointment needed, in the hopes of finding a buyer. Likewise, those looking to buy a house get on their bicycles and pedal around the city knocking on doors of participating houses. Interestingly, while the Netherlands organizes national open house days, I have never seen this on such a large scale in the US. Usually individuals decide when to have an open house entirely of their own accord, not in cooperation with any other homes in their area. This might differ from city to city. 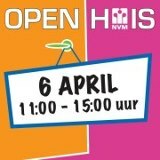 Personally, I think a national open house day is a fabulous phenomenon: you can look at a lot of houses in four hours! Open House is also used in another very common context, at least in the US. The evening that parents are invited to the children’s school to see what pictures the kid has made, have a chat with the teachers, and find out what the kid is learning– “Ouderavond” — is also called Open House. During an open house, the (elementary) school opens up its doors to parents. Notice that in both contexts we say having an open house if you are the one giving it. Enjoy all the open houses today!